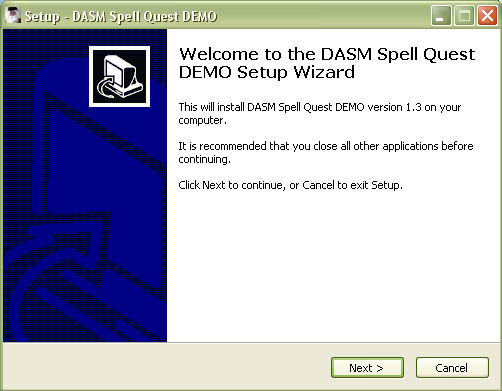 DASM Spell Quest v1.3 demo online manual. · Some words or spelling seems incorrect? 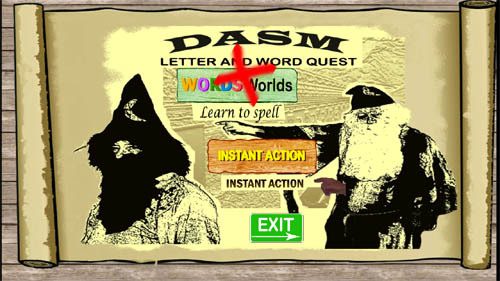 World of DASM Spell Quest has been created to make spelling fun. This software can be used as a reward system for kids, students and clients who have completed their set work. DASM is also good for kids, students and clients who have trouble grasping Spelling. DASM is a huge open world game with spelling problems and a special reward system. As you solve puzzles, you are given the choice of either doing, “Mini missions” or “Quests” and search for “Spelling tokens”. As players progress, the levels gradually become more and more difficult and intense but also become more and more fun! DASM is about two brothers who are always constantly fighting. They are both Magicians and the younger Magician brother has been banished and placed inside a mountain and cannot Re-enter DASM unless he learns to behave himself. His first victim, errr…..I mean client….is YOU!!!! The path on how to get there is your choice….. 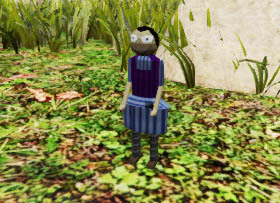 Pick flowers, find dolls, locate Ferret tokens, locate bonus tokens, find clothing, check your statistics, watch your rank and explore huge worlds while on your quest. The World of DASM is a very “graphical game” and requires a decent or reasonably powerful PC to run the software. If you fall under the minimum specifications, the game will run very poorly or not at all. We have added a new option with this DEMO v1.3 that allows you to turn all the graphics down but it may still run poorly on lower end Pc’s. Operating System: Windows XP, windows Vista. CPU: 3Gb Duo Core Processor or similar. Graphics Card: GT9800 with 512Mb Ram or above. Graphics Card: GeForce GTX460 with 1Gb Ram or above. Double click the DASM Spell Quest DEMO icon. This is a brief explanation of what you are about to install. 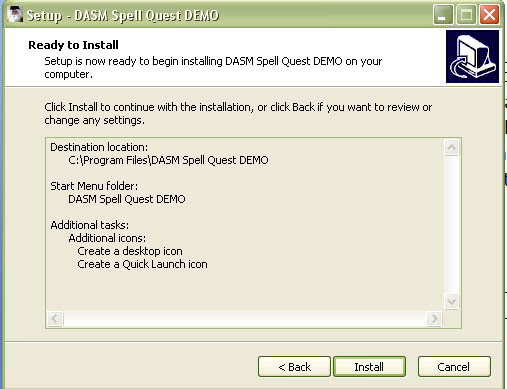 Please stop any other applications or installs of any other software while DASM Spell Quest installs. Here you will need to accept the license agreement. It will not install if you do not. Installing this software means you agree with the terms in this document. Click, “I accept the agreement” radio button and click next. This is where DASM Spell Quest is going to install. Just click” Next”. Changing the folder may cause issues so if possible leave this in its default directory. Otherwise, this is where you can chance the directory of the install if you need to. On this screen we are just confirming that a shortcut folder is going to be installed. Depending on your operating system this will add shortcuts to your PC. In this part of the install you have a chance to add a desktop shortcut and/ or a quick launch icon. If you do not want to, just click “Next” and leave the options blank. We are nearly ready to install now. On this screen you have a chance to check to see if you are happy with the choices you have made. If not, click “Back” and make the necessary changes. There is a small amount of information here about some possible bugs or issues that may occur. One action that might have to be taken is that on your first install you may need to press F11 on your keyboard or hold and press ENTER + ALT key for a full screen if it is minimized. This only needs to be done once if you have to do this. Now that the game is installed, you can simply run the game by pressing “Finish”. 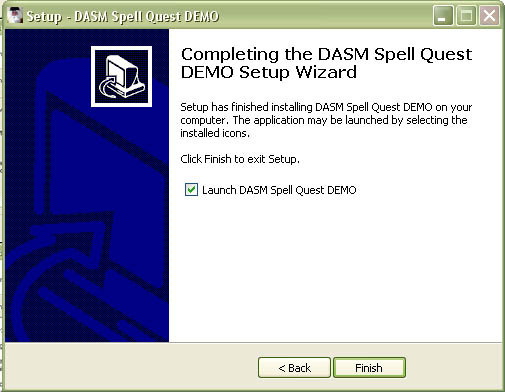 If you don’t want the DEMO to start you must un-tic the box “Launch DASM Spell Quest DEMO” box. When the game starts there is just one more license agreement to accept. If you do not accept the game may just “crash” or stop. Like most game installs you must agree to any licenses before it will run. 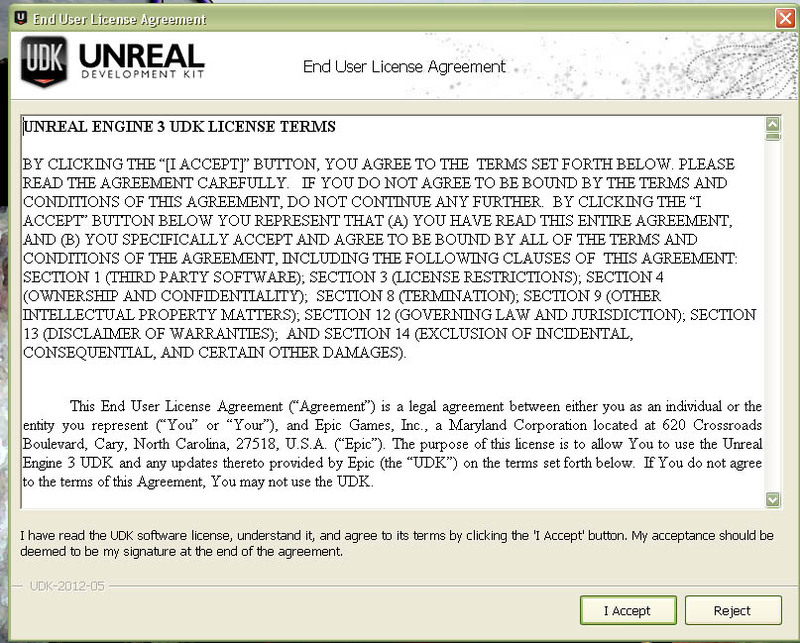 This license is for the UDK system provided by Epic games. If your Pc picks up this software please allow it. With older operating system like windows XP you may even get a message to “Run As”. 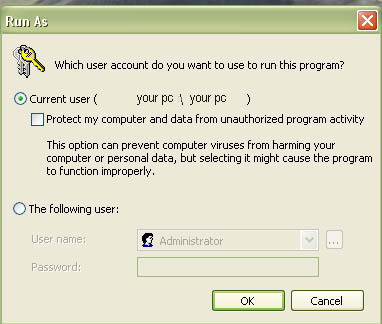 Make sure current user is selected and “Protect my computer and data from unauthorized program activity” is un-ticked. If not the game will not run and will crash then show an error. If you are using older operating systems you can click the uninstall icon in your, “Start” and “All Programs” list. 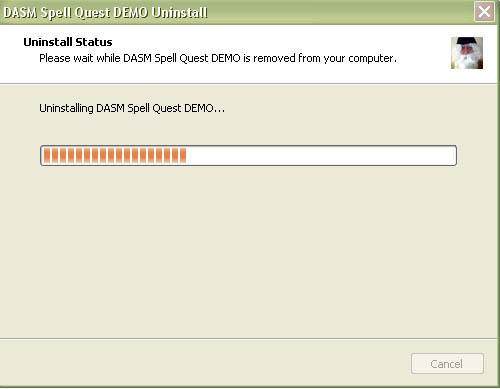 After clicking Uninstall or Remove you will be asked if you want to remove all components that relate to DASM Spell Quest. Click yes to agree. Click OK after uninstall has completed. NOTE* Because DASM Spell Quest uses a 3rd party installer sometimes some files can be included in the installation also. You may have to repeat the same process as the above steps to remove them from your Add/Remove registry. They will still register as DASM Spell Quest so look through your list. If you do not change the directory during installation the save files are located at: C:\Program Files\DASM Spell Quest DEMO\Binaries\Win32\UserCode. You can easily back up and remove these files and save them in another folder with your student/clients name on it and save them to disk or a removable USB device. By removing these files it also allows the next user to save their own files and play their own game. If these files are removed you will no longer be able to create any .SAV files and save the game. So if you are going to “remove” any files make sure they are .SAV files only. Basically this means that if you are going to back up any users files don’t cut and paste them but copy and paste them into another folder before backing them up and delete any .SAV files after or you could simply just cut and paste the SAV files only. It will not hurt if you copy over the original UltimateSaveSytem files from a backup too because these files never change but are just required. 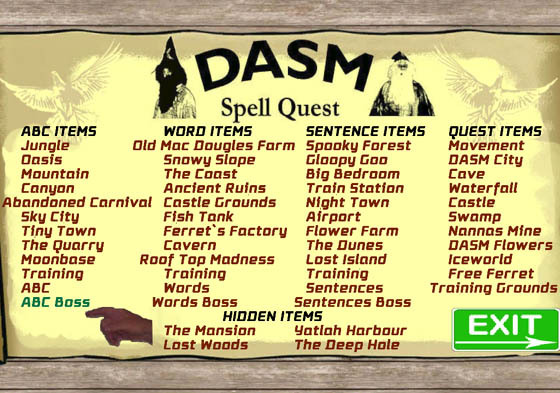 DASM Spell Quest is a reward based game. Basically the more puzzles you solve, the better the game gets, the harder it gets. By doing this we can keep the student interested, relaxed and wanting to learn, just to make it to the next level! A lot of work has gone into this program to help develop thinking for students. The year group that this program is perfect for is about year 3 up to year 6 but will also work for students who are having a little difficulty in developing their skills still. (Year 7 maximum). 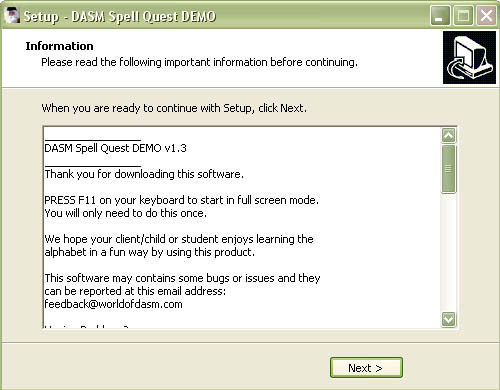 DASM Spell Quest is best used for when students have completed their set work and have free or spare time. Some students may even struggle at the interface of the game at the beginning so don’t be too surprised if you may have to guide them a little. Below is a description of what the buttons are for. 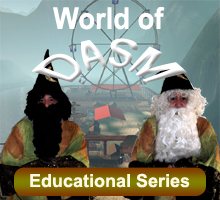 Click the World of DASM button to start the user tutorial. This button loads the movement map. 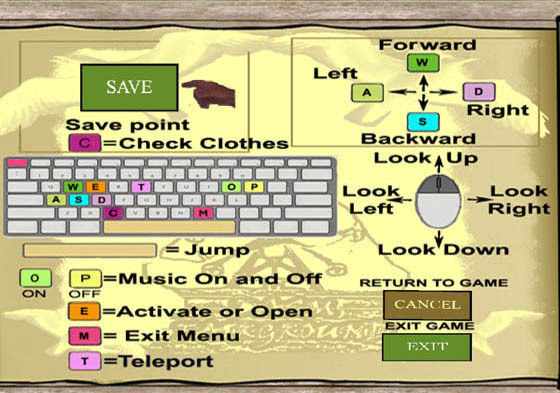 This map teaches the user the basic interface of the keyboard buttons and mouse and shows how to move around. 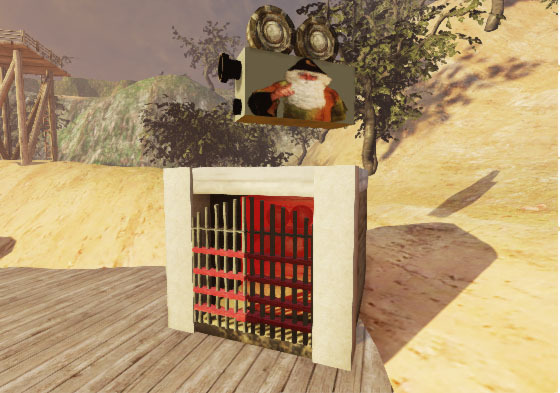 · Click the Training Grounds button to go directly to some puzzles. This trains users on how the puzzles work and how to solve them. · Click the CREDITS button to view a little mini credits movie. · Click EXIT to exit the game. Once you click EXIT you will be asked if you are sure you want to leave. · Click EXIT again and game will end. Click the ABC Worlds button to start the ABC campaign. You will have to solve a few ABC puzzles before visiting the “Boss level”. Click the INSTANT ACTION button to run around freely solving ABC puzzles on easy, normal or hard. · Click the WORDS Worlds button to play 2 Instant Action maps. The WORDS Worlds button is unavailable in the DEMO version. 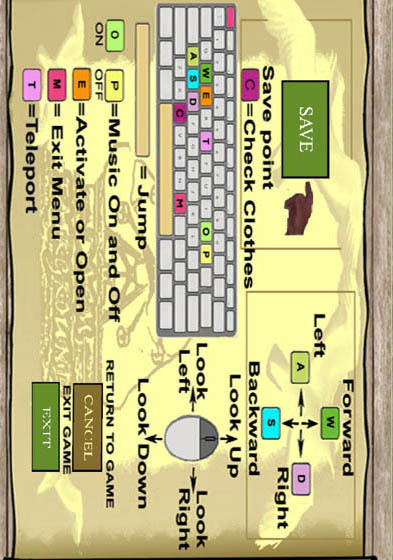 Click the INSTANT ACTION button to run around freely solving word puzzles on easy, normal or hard. · Click the SENTENCES Worlds button to play 2 Instant Action maps. The SENTENCES Worlds button is unavailable in the DEMO version. Click the INSTANT ACTION button to run around freely solving sentence puzzles on easy, normal or hard. · Click the STATISTICS button to view your stats. This is your statistics screen. Here you can see what you have collected. (Missions and hidden levels are not available in the DEMO version). This screen also shows your rank and levels played. There are two more buttons here they are “Levels Played” and “Items Collected from maps” buttons. On your stats screen if you click “Levels played” this gives you better details on exactly what maps you have played. This allows you to keep track on what you have done. Be aware that instant action levels will not show until you complete them first. On your stats screen if you click “Items collected from maps” button you will see what maps that you have collected all items from. To activate this you need to get every item in one go. These items are a doll, brother token, spelling token and bonus items. This is the options screen. If your pc is slow then click SLOW PC. If you have a square monitor click SQUARE SCREEN. If you don’t like the sound tracks then click OFF for the music. 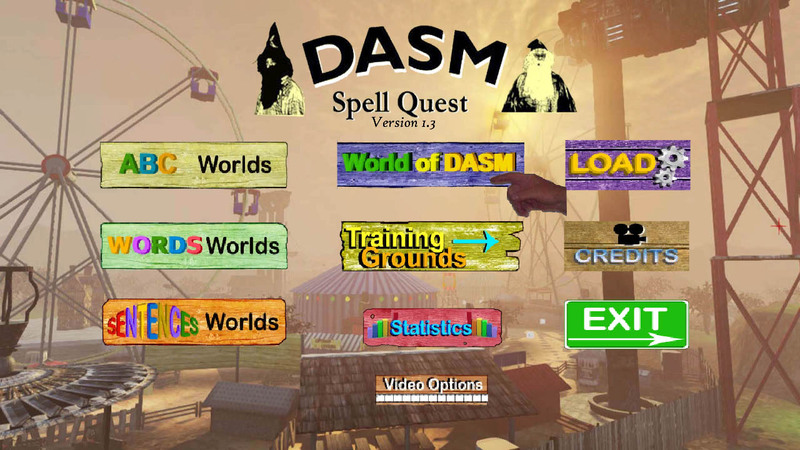 NOTE* DASM Spell Quest uses HD resolution of 1280x720 and will not display correctly on square monitors. The great news about DASM Spell Quest is that you can save now so if you leave and come back later you can continue from your last “Checkpoint”. 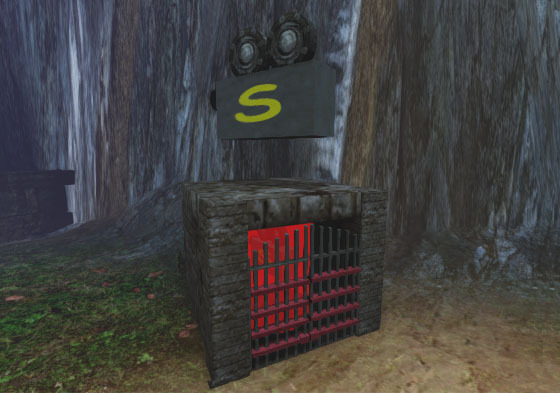 The save file will not remember where you were last standing or what you were doing but it will remember what you have collected and what map you were on. 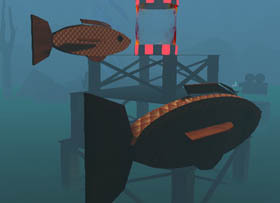 For example: You have just finished one of the Training Grounds puzzles and had to leave, you click save then exited. You come back later and click load in the load menu. The game loads and you will be back in the Training Grounds but you will be standing on a checkpoint. (Red teleport machine). If you go back and try the same puzzle again that you “completed” earlier it will be closed and you will need to try another puzzle. Any chest or tokens you have found earlier will still be in your inventory so you do not have to collect them again. For some players they may want to go back to a previous map to collect an item that they forgot to collect. The good news is any items on maps you previously played will still be remembered and you will only need to collect the items that you did not find but will have to replay the puzzle while finding them. To use the save system just click save in your options screen by pressing M or the Esc key and it will save the map you are currently on. Sometimes the game will auto save at certain checkpoints too so don’t worry too much if users forget to. NOTE* Instant Action maps do not have a save system. Here is an example of the loading system. To get to this screen you must click LOAD in the Main Menu of this game. An image will appear of the last map you played. Just simply click LOAD next to the image and that’s it. NOTE* The Main Quest is not available in the DEMO. Instant Action maps cannot be manually saved but save automatically once you find an item or finish the puzzle. This means that if you pick up a token and exit the game straight after you will lose it. So make sure the puzzle is finished first. With the 3 Instant Action training maps you can only get an item once. This stops users from taking advantage of collecting items because they are only small maps and can be easily used to cheat with. With these normal maps if you leave and return you will have the items you collected still if you clicked save before exiting. 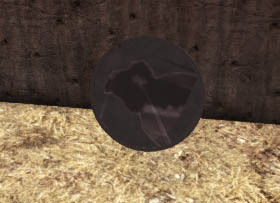 On normal maps an item can only be picked up once. Depending on what map you are playing a HUD (Heads Up Display) may appear. There are a few different types of HUD`s and they will change in shape or size to whatever map or level of difficulty you are playing. Below is a basic example of a HUD. 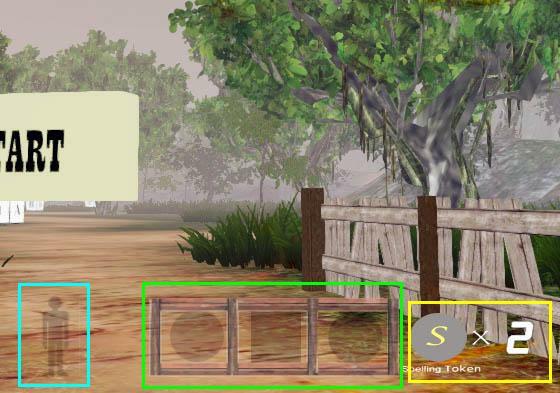 The image shows some colored boxes that highlight the different HUD`s. The green HUD is items you have collected. The yellow HUD is how many Spelling tokens you are carrying. NOTE* Spelling tokens can only be spent in the full version of this game only. Only 100 Spelling Tokens can be collected and held in your inventory at any time. Once you reach 100 you will have to spend them before you can collect more. 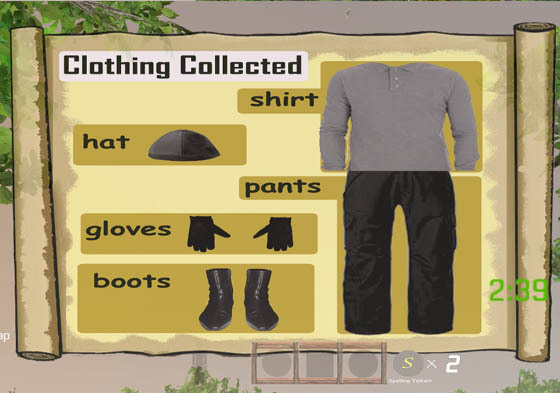 By pressing C you can bring up the clothing HUD. The clothing HUD shows everything the blue HUD above does but much larger. On the bottom right is a timer HUD. This HUD counts down like a clock and once it reaches 0 you will have to start again. The timer HUD only appears in normal and hard settings. When you reach a Boss level the HUD will change again. It will include some boxes with crosses. This HUD will show you how many chances you have before you have to restart the game. Some HUD`s will support up to 4 items, especially if you are playing on a hard setting. There is one more HUD and that is an item HUD. 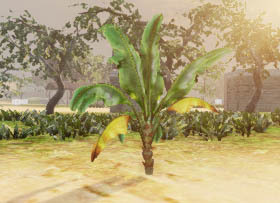 This HUD only displays on hard and involves collecting some sort of mystery item such as a banana tree or a water canteen for example. 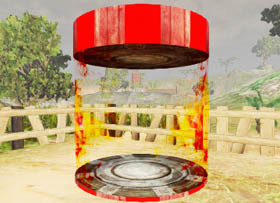 There are various types of hint boxes and they are activated by walking into them. Hint boxes are reset if you exit the map and start again. 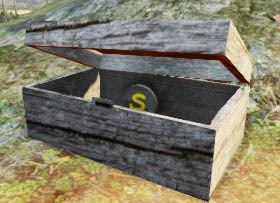 Hint boxes sometimes give you an idea where an item or secret may be hiding. Eyeglasses give you a bird’s eye view of where you are and the surrounding terrain. Sometimes it can show secret areas too but are mainly just for fun. Eyeglasses are found everywhere on most maps. This is a hint box. It will not open unless you play on normal or hard on Instant Action maps only. On normal it will show you where that item is. On hard it will only show an image. It can only be activated once unless you leave the map and re-enter it. This is a Treasure chest or Spelling token hint box. This will guide you to a Spelling token of some type. As above this can only be activated once and can only be used on normal or hard settings. This is a Doll hint box. Dolls can be collected just like Spelling tokens and Brother tokens. You can collect up to 100 Dolls, 100 Brother tokens and 200 Spelling tokens and your collections can be viewed on the stats screen. 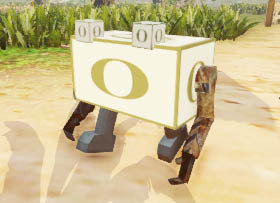 Hint boxes are only found in Instant Action maps. 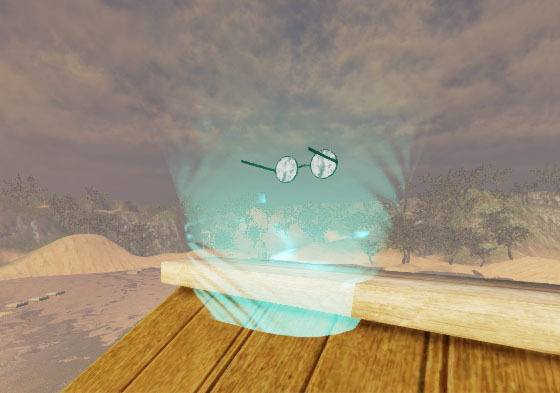 Blue teleports can teleport you long distances or take you to different worlds. Blue teleports are found all over DASM and sometimes they need to be activated for them to work. If they do not work they will look like a Red teleport. Blue teleports are used as exits. 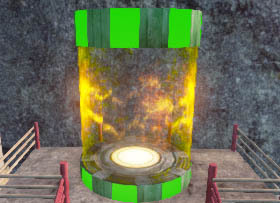 Red teleports are an exit from a Green or Blue teleport or they are a Green or Blue teleport that has not been activated yet. Besides that, they really don’t do too much at all! Green teleports are teleport systems that only take you a small distance. They are sometimes part of a puzzle and are really handy if you want to quickly travel somewhere. 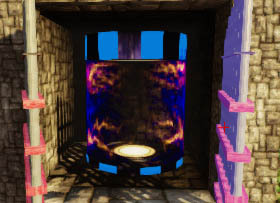 Green teleports can be used as an exit like the Blue teleports. 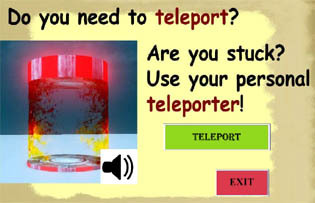 DASM Spell Quest has a new teleport system known as the personal teleporter. This device is activated by pressing the letter “T”. This device is worn by all people who enter DASM. It can be accessed by pressing T on the keyboard but sometimes it can be deactivated. It is good for when you get stuck or it can be used as an advantage to teleport back to a certain area without having to run there. Treasure chests will always contain a Spelling token. 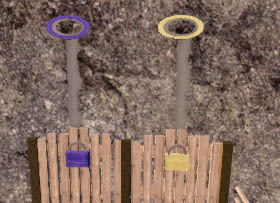 Spelling tokens are used in the city of DASM to buy items with such as keys or torches. Clothing chests look the same and sometimes they are empty. Lost dolls are found all over the place. By finding a lost doll you are making a DASM citizen happy because all lost dolls are returned to the lost and found fairies house in the city of DASM. Mystery items can be a tree or a water canteen or even tin cans. On the hard setting in the Instant Actions maps you will be asked to collect a certain amount of these items. It can vary between 10 to 30 items depending on what map you are playing. 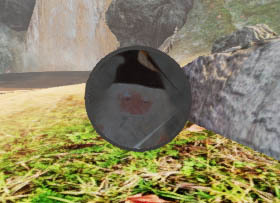 Bonus tokens are found in certain maps. If you collect all of them you will receive a Spelling Token. Nobody owns bonus tokens and just like weeds growing in a garden they pop up everywhere. 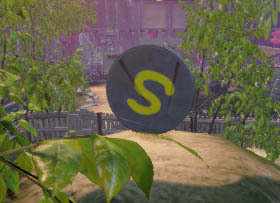 Spelling tokens are an income used in the city of DASM. You can buy items like keys to open up other worlds and torches to light up dark underworlds and caves. Collect as many as you can. Keys and locks are available in the full version of DASM Spell Quest and can be purchased at Bertos Barter. Sometimes keys can open secret areas or worlds. Brother birds are angry birds who like to get in your way. Try to avoid them at all costs. 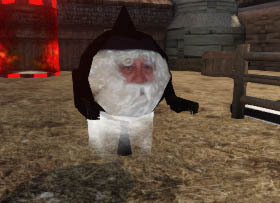 If you make contact with them they will send you back to a red teleport and will take away a chance if you are on a boss level. These workers are built at Ferrets factory and come all shapes and sizes. They are controlled by Helga at Helga’s Town Hall. Some are loyal to Brother and they are less maintained and can be a little rusty. Snowies are blown around in the wind and should be avoided. They are very cold and once you are touched by them the only way to warm up is the gentle heat from the light of a teleporter. Brother heads are special workers but they moan and groan and always grizzle about something. Some are shy and will just run away. Brother is known to be able to control these heads remotely. Goldfish don't do much but they can knock you off from what you are doing and can be a problem if you have a time limit to do something. Wait for them to swim past if you can before you do anything. Native workers live on remote islands and like to fish and dance. 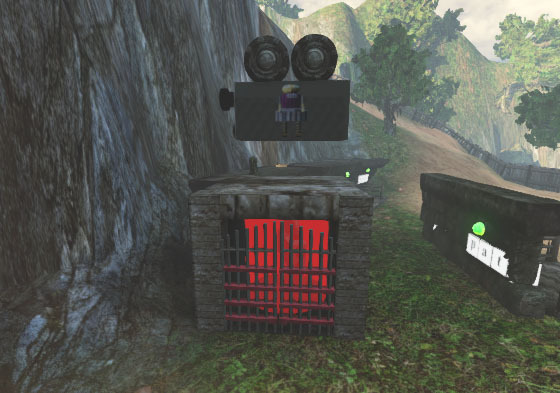 They are harmless and are some of the earliest robot workers to settle in DASM. They live in peace and never cause any trouble. 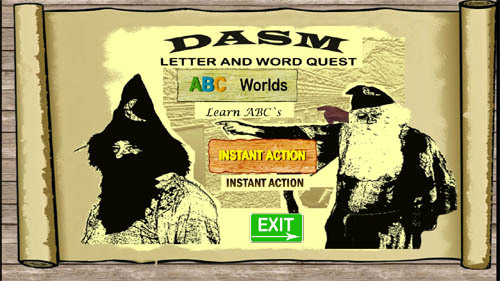 DASM Spell Quest is audio and text based so students who have difficulty in reading or hearing may also benefit from the game. How does a student benefit? In today’s modern world students will need to interact more with PC`s or Mobiles and Hand Held devices to keep up with the changes. DASM Spell Quest teaches them the basics of this by fine tuning their motor skills first, then it makes them think, read, & listen subconsciously. When some students have learning issues they can become worked up and this can cause them to have difficulties during a lesson. 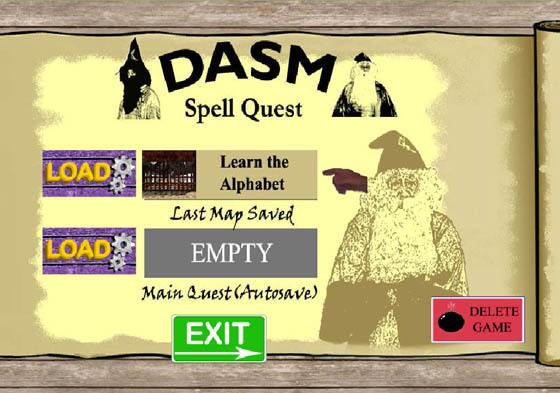 DASM Spell Quest is a relaxed role playing game which should help the student to settle and become more confident. 1. By letting the student freely roam open worlds. 2. They can choose the puzzle they wish to begin with. 3. They can work at their own pace and speed. 4. 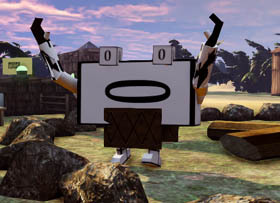 They can collect items and explore. 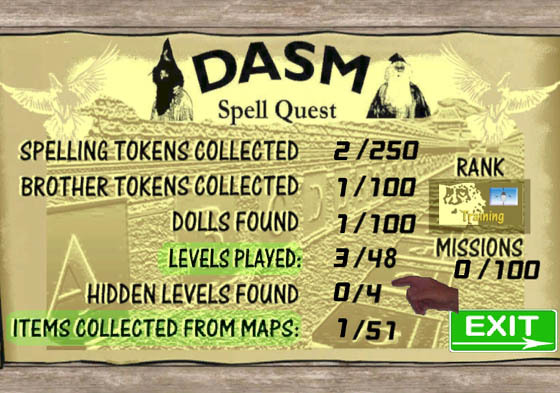 With the FULL VERSION of DASM Spell Quest, when completed, students should have a sound knowledge of basic spelling and be able to problem solve and make decisions. Navigate through certain interfaces and troubleshoot. They will also have more confidence during lessons after overcoming some spelling barriers that they may have had in their past. The DEMO version of DASM Spell Quest should be enough to help students who are struggling with the basics of spelling. If a student cannot play the game or is having difficulty then play it for them and ask them to guide you but get them to call out the letters or words as you progress. Copy and paste the image below to a PC or a storage device and edit the image instead of printing this manual out. By doing this you will be able to expand and shrink the image to suit your needs and your printer. Issue-Sometimes game will not start full screen. Fix- When game starts, press the F11 key or hold: ALT & Press Enter and game will enter Full screen Mode. This only has to be done once or after every fresh re-install. Please do this at the start screen or menu screen or the below issue may happen. NOTE* If you do nothing at all the game is still playable but only in a small window view (minimized), and some text will not display correctly. Issue- After pressing ALT & Enter or ALT-TAB from game and ALT-TAB Return to game graphics issue. Fix- Do not ALT-TAB from game. Sometimes though, after a while it does rectify itself but not always. The graphics that normally are affected is the Terrain. If you have to ALT TAB from game, or CTRL, ALT & Press Enter on keyboard to go to Full Screen mode try doing it during the Main Menu Screen. Fix- You have the game installed already and you are installing a different version of the same game. Just delete the game installed and then re-install the version you want. If it is still showing a error, locate installation folder and manually delete. Issue- Game runs poorly or slowly on Virtual Server. Fix- Depending on the power of your server, the only fix is to reduce the amount of players using the server. Issue- There is a black strip on the top and bottom of my screen. 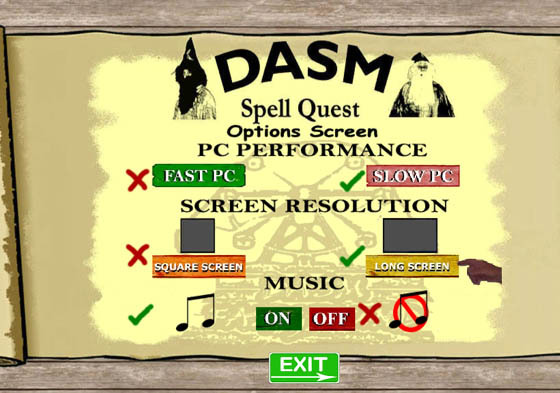 Fix-You can press auto adjust on your monitor but DASM Spell Quest uses a HD resolution which is 1280x720. So for most square LCD or CRT monitors there is not a great deal you can do. We are trying to rectify this issue but this resolution is integrated into UDK which is what DASM Spell Quest is built with. Fix- Here is a list of possible fixes if the game crashes. · Run software as administrator or compatible mode. · Install software in its default directory. · Update or upgrade any sound or video card drivers. · Reinstall Microsoft .NET. The file is located at: C:\ Program Files \ DASM Spell Quest DEMO \Binaries\InstallData\ dotNetFx40_Full_setup.exe. · Memory leak or you need to add more ram memory. · Hard drive fragmented or full. Defrag drive or delete files. 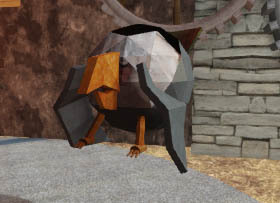 NOTE* DASM Spell Quest is known to conflict with 64 bit systems and this is still an ongoing problem which we are still trying to rectify. Issue-There is more than one DASM Spell Quest game in my add/remove list. Fix- Just simply click the extra install and click Remove. 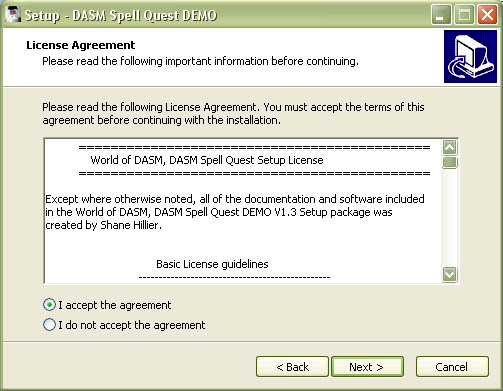 NOTE* Because DASM Spell Quest uses a 3rd party installer (Inno), it installs its own registry but it is easily removed and causes no known conflicts. Just remove it. Visit www.worldofdasm.com for any future updates. Issue-Pressing Spacebar cancels game from loading. Fix- Don’t press the spacebar it will quit the game from loading. If you want the game to load quicker or you wish to skip the start up press ESC on your keyboard. The spacebar is basically a shortcut that cancels the game from loading if you need to exit but is only active while loading the main menu. Thank you for trying my software. It has been a difficult task but because children worldwide are suffering with their education DASM had to be created. There is no magic bullet or miracle tonic for education but this is a start and has never been attempted before. If children can learn how to play videogames then they can learn the interface to this software. If they struggle then an adult should play with them and help guide them. It is our duty to help these children and we will. A new revolution of education has begun! Some words or spelling seems incorrect? Please understand that there is no real “universal” English. 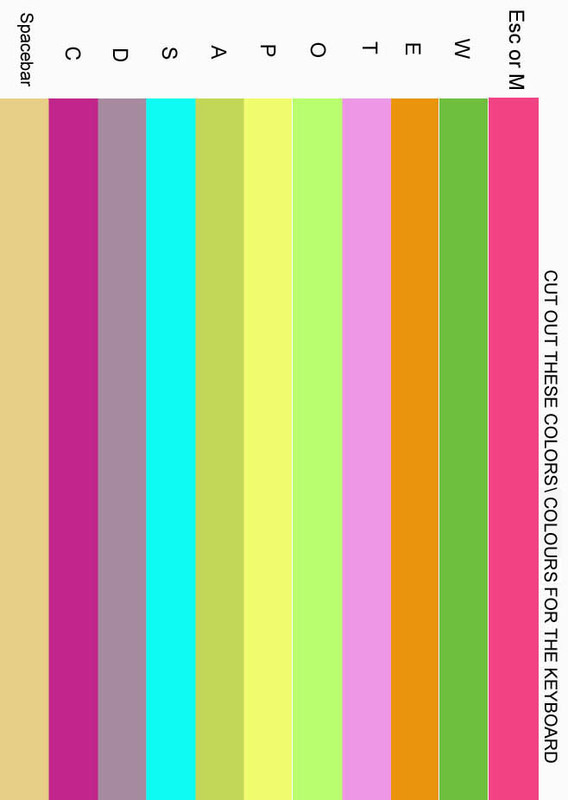 For example in Australia color is spelt colour. Even how our sentences are structured are different worldwide including accent. 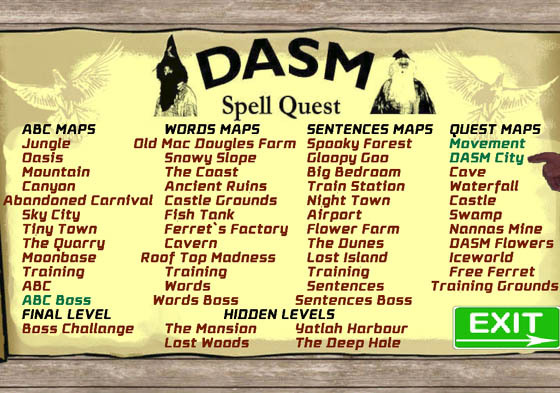 Understand that DASM Spell Quest is Australian therefore some words may seem like they are spelt wrong or are structured incorrectly. We even have the word “mate” in DASM and this may cause some confusion. In other countries this word is to do with life forms doing what nature requires them to do. In Australia it means “friend” or “comrade”. The worst case scenario is that there may actually be a spelling error in the game itself which could have been accidentally overlooked. Please email us and report any of these bugs to us immediately so they can be corrected in future updates. 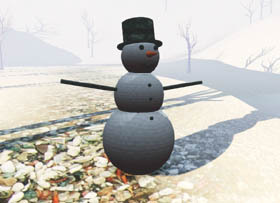 World of DASM was created with UDK. · Crusha for the coding. · [WuTz! ], creator of the wTech engine. 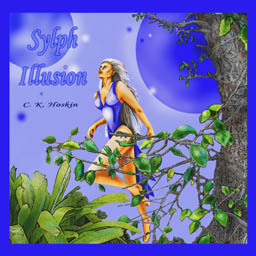 · Ayalaskin for providing the tutorial. · Wormbo for useful hints. Thank you Ausgamers for your kind support and for hosting our files.